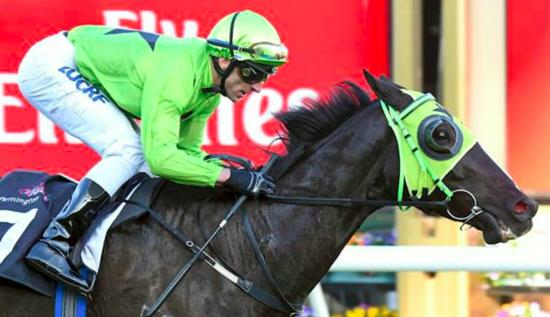 Tasmanian galloper Tshahitsi provided jockey Brendon McCoull and co-trainers Chris Crook and Imogen Miller with a first win at Australia’s most iconic racecourse through a dominant victory in Saturday’s $100,000 Rod Johnson Handicap (1400m) at Flemington. Sent straight to the front by McCoull, Tshahitsi ($6-$4.20) never looked in danger and sprinted clear in the home straight to defeat Loyalty Man ($12) by 3.25 Lengths, with Royal Rapture ($11) running on into third. McCoull, 43, said it wasn’t the plan to lead on the five-year-old but once he found the front there was never a moment’s worry. “He’s the sort of horse that you have to ride him bad to ride him good sometimes. He’s a free rolling horse, he gains momentum and as you saw today he was strong on the line,” McCoull said. “Even though being in front wasn’t really the plan he just travelled so easily. I was very confident all of the way that he was going to get to the line strongly.